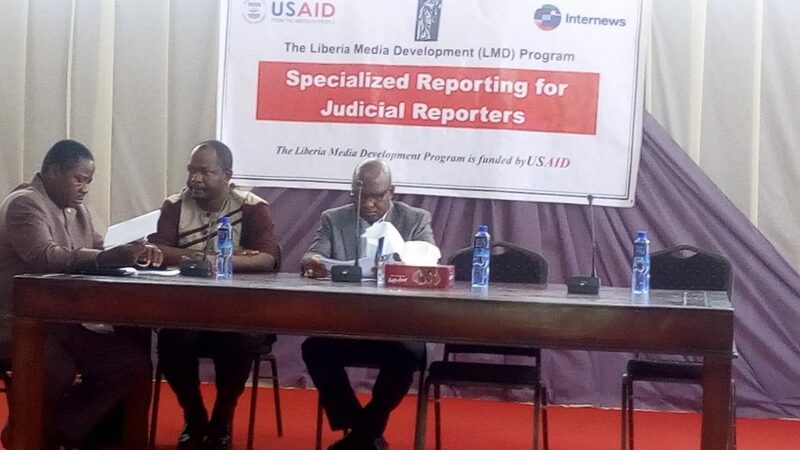 Monrovia – Chief Justice Francis S. Korkpor has admonished media practitioners to be honest in their reporting especially on issues that border on the rule of law. The Chief Justice made the statement at the closing ceremony of a week-long Specialized Judicial Reporting Training for journalists covering the Judiciary. “Please, I just want you to report the truth; that’s all. We don’t do anything in secret at the Judiciary. If you don’t know what had happened in Criminal Court A or the Circuit in Bassa and you are carrying your news from there, go to Attorney [Ambrose] Nmah; he will give the official account of what has happened there,” Justice Korkpor advised. Chief Justice Korkpor also frown on the way journalists report on the Judiciary, asserting that he has been the target of wrong reportage from the media. “Some of you for pecuniary benefits, you take the news to be your news instead of being objective. You portray the judge as being corrupt; it is already at the back of your mind in reporting. The Judiciary is a unique place,” he said. He reiterated that the media have painted the Judiciary like monsters base the way they report on it or on matters that come from the Judiciary. “I am not an enemy to anybody, not to you, otherwise I would not have come to say sit down here and make your work a little bit comfortable,” Justice Korkpor stated to reporters, who cover the Judiciary. He provided them an office space, which he furnished with some office materials. He added that the Judiciary is a traditional place, justices, judges’ talking come through the opinions or judgments they render. “If you report correctly, it helps the society and if you report wrongly, it breaks down the system. If the system breaks down it affect all of us. Please, I just want you report the truth; we do not do anything in secret in the Judiciary,” the Chief Justice pleaded.